Virtual reality technology is rapidly being developed and is attracting enormous amounts of funding and general interest. 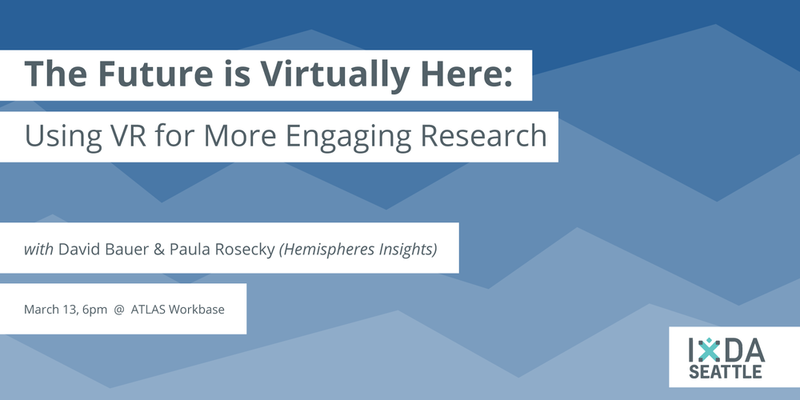 This presentation will provide an overview of virtual and augmented reality and explore how this technology will likely change marketing and design research practices. Several agencies have started using VR for research and in this presentation we'll explore some of these initial case studies. You will hear the perspectives from researchers at Hemispheres Insights and how they see this exciting technology being used in the coming years. David Bauer has spent over 20 years exploring human perceptions and behaviors and their implications for business strategy. He founded the consumer insights agency Hemispheres in 2003. David and Hemispheres offer qualitative and quantitative research as well as ideation, user experience and strategy consulting. Working in Seattle since the mid-'90s has provided him with many opportunities to examine how the online environment and tech devices are shaping consumer experiences. Prior to Hemispheres, he held positions at Q2 Brand Intelligence, Publicis, Tattoo brand consulting and Morla Design. David earned a BA in writing and marketing from Santa Clara University. Paula Rosecky brings a global perspective to Hemispheres and its clients through work with multinational companies and multicultural consumers. She leads qualitative and quantitative projects and inspires others to understand the perspectives of clients in large organizations and agencies. She is well-versed in conducting immersive ethnographic, shopper, UX and online community research. Prior to joining Hemispheres in 2008, she held consumer insights and planning positions at Miller Brewing Co. (now MillerCoors), DDB, and HoundDog, a division of IdeaPlanet. She earned a BA in sociology from the University of Wisconsin - Madison and an MBA from Rochester Institute of Technology in association with the Charles University in Prague. She is also a co-chair of the PNW chapter of the Qualitative Research Consultants Association, a continuing education organization for qualitative researchers.